Christmas morning for these North Myrtle Beach South Carolina folks started out with Frank and Elaine waking up with extended family in Kentucky. When the time came to start opening gifts, Frank gave a gift Elaine had not expected! 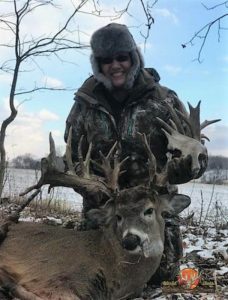 Elaine has harvested a few deer in the past couple of years, and really enjoys getting out into the woods with Frank. 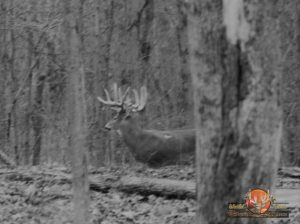 A Hunting trip to World Class Hunting Ranch!? Wait, when? We leave tomorrow? Oh, wow! Elaine had no idea Frank had packed a gun in with the rest of the luggage! So, they arrived on Tuesday the day after Christmas around 3pm, and checked in at the Resort, later on Rich and Owen met up with them for a few minutes to discuss the hunt starting on Wednesday. On Wednesday morning it was like 5 degrees and a bitter wind. They were in the blind before daylight, but there was not a lot of deer movement in the forenoon. They did see a few bucks Elaine was thinking she would drop the hammer on if the opportunity presented itself. After a warm meal at the local Restaurant for lunch. 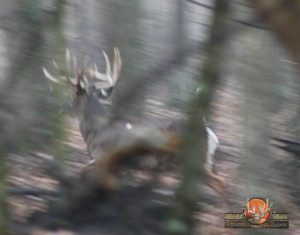 They headed back to the blind, where the Propane heater was fired up to take the chill off! 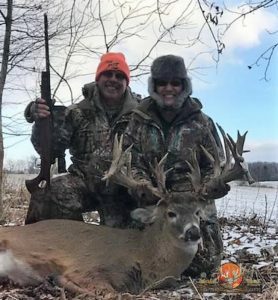 High Five, a 300″ or bigger buck we had seen numerous times, and Elaine had shown some interest in, kept coming past the blind, so finally Frank asked Rich, what if Elaine were to shoot that buck? So Rich made a phone call, and Wow, what an opportunity! Frank and Elaine decided if High five came thru again, he would be going home with them! Long story short, toward evening, here he comes, Elaine made an awesome shot, and High Five was hers! 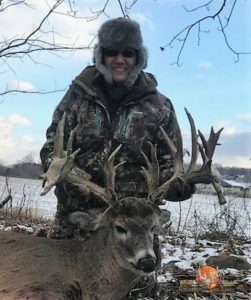 Congratulations on an awesome Husband / Wife hunt! Frank has booked a Memorial Hunt(in memory of his Dad) for himself ,his brother and Nephew for this fall! 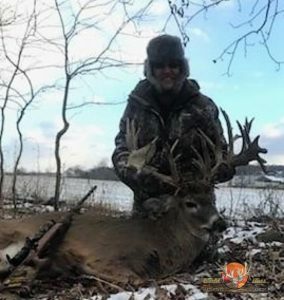 Let’s see if he will be able to beat this awesome buck Elaine took!